DC Comics has dropped plans to publish a series that imagines Jesus Christ returning to Earth and teaming up with superheroes, after a campaign calling the work blasphemous. “Second Coming” will not now be published by Vertigo, a unit of DC Comics, next month as originally planned, a source close to the issue told AFP Tuesday. 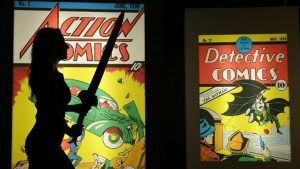 DC Comics, which holds the rights to Superman, Batman and Wonder Woman, refused to comment. In an interview with the website Syfy Wire, the author of the series, Mark Russell, said DC Comics had asked him to make major changes to it and he refused. He attributed the request to a campaign that reportedly collected more than 234 000 signatures and sought the withdrawal of the series on grounds it is blasphemous. In “Second Coming”, God sends Jesus Christ back to Earth and he teams up with a super hero named Sun-Man who is supposed to help him toughen up. The signature campaign began after the publication in January of articles about the series on the websites of Fox News and the Christian Broadcasting Network, which was founded by televangelist Pat Robertson. “Second Coming is closer to blasphemous than biblical,” Emily Jones, a CBN producer, wrote on January 8. “I think the religious fundamentalists and critics who are trying to stop Second Coming aren’t interested in protecting Christ so much as their ability to control his narrative,” Russell told Syfy Wire. “They probably (correctly) suspect that it’s not Christ who’s being parodied, but themselves and how they’ve twisted his teachings of mercy for the powerless into a self-serving tool of the powerful,” he added. He said DC Comics and Vertigo had agreed to relinquish the rights to “Second Coming” and he plans to have it published by another company. The post DC Comics drops plans for series with Jesus alongside superheroes appeared first on SABC News – Breaking news, special reports, world, business, sport coverage of all South African current events. Africa's news leader..